On our website we have in the past reported on the benefits of a resin bonded resurfacing install to protect your existing surface. The surfaces we primarily cover are concrete and tarmac. Why? Because these are two products offering outstanding durability for our homes and gardens. We as a country build with concrete as it is a highly efficient product in the long term. Making concrete a valuable surface to protect and extend the life of. We work with existing surfaces to protect and improve when surfaces are still structurally sound but have some surface deterioration. Minimising weeds on the surface is an added benefit together with anti slip properties. 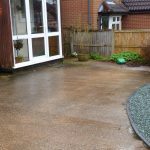 Resin Bonded Gravel and Resin Bonded Aggregate providing concrete resin resurfacing an alternative to the usual options for your driveway path or patio. If it’s not broke don’t fix it. We are based in Nottinghamshire but accessible to Yorkshire and Derbyshire areas. We have completed anti slip surfacing in Skegby, Aspley, Bilsthorpe, Bulwell, Clay Cross, Cotgrave, Doncaster, Huthwaite, Leamington Spa, Mansfield Woodhouse, New Houghton, Northampton, Pentrich, Peterborough, Ravenshead, Sellers Wood, Shirebrook, Sutton Bonnington, Toton, Warsop, Worksop. 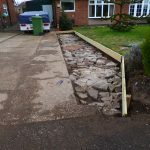 This entry was posted on Thursday, January 31st, 2019 at 8:11 am	and is filed under Concrete, Diary of a Mansfield Resin Driveway Company, Driveways, gardens, Imprinted Concrete, Latest News, Patios. You can follow any responses to this entry through the RSS 2.0 feed. Both comments and pings are currently closed.